Count your blessings instead of your crosses. Count your smiles instead of your tears. Count your health instead of your wealth. Love your neighbor as much as yourself. I truly love anything to do with counting blessings. I love the old hymn lyrics “…name them one by one.” I love to hear Bing and Rosie warble “…count your blessings instead of sheep” in the movie White Christmas. I love a day that focuses on being thankful. 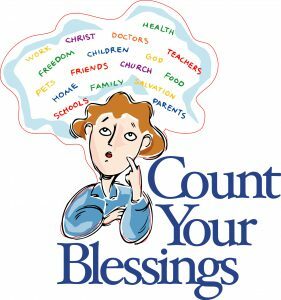 Counting blessings keeps us focused on what really counts! Thanksgiving often gets slighted in department store decorations that usually morph from Halloween into Christmas without giving Thanksgiving a proper nod. I guess a big turkey and Pilgrims dressed in drab costumes can’t compete with spooky witches or goblins and colorful Christmas trees. But on the other hand, maybe it’s okay. We shouldn’t really need to be reminded to be thankful, should we???? It should be a daily mindset instead of a once a year activity. The older I get, the more I realize how many blessings I enjoy. For me just breathing, sleeping, and being able to get out of bed in the morning have become reasons to rejoice. And what a privilege it is to have clean food to eat, decent water to drink, shelter from a storm, and warm clothing in winter. Basics? Yes! But these are basics many people live without. Living in the U.S. affords us many freedoms other parts of the world do without. Perhaps there is more government involvement in our lives than we wish, but freedom of religion is still a privilege many countries don’t offer. We can still openly worship God and read the Bible without fear of retribution. In other words, think of what we have, not what we don’t have. The Pilgrims understood this better than anyone. It is said that in the first year in this new land, they made seven times more graves than huts. Still, when the harvest was in, they gave thanks to God. They knew how to count their blessings instead of crosses and losses. Hmm? That reminds me of my grandmother’s sampler. Consider this… Those who truly understand the meaning of Thanksgiving know Who is responsible for every blessing they have.